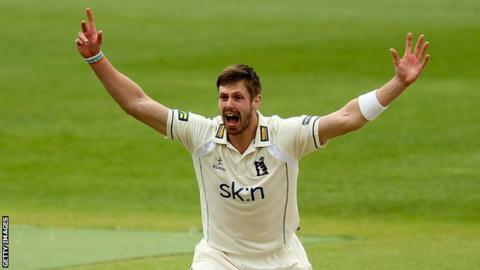 Warwickshire pace bowler Boyd Rankin is being linked with a return to international duty with Ireland. Northern Ireland-born Rankin, 31, played for Ireland from 2007 to 2012 before switching allegiance to England in the hope of playing Test cricket. But he suffered cramp in his sole Test appearance against Australia in January 2014 and then dropped out of favour with his adopted country. Rankin is reported to be set to hold talks with Ireland in the coming weeks. Ireland officials did approach the fast bowler last summer in the hope of convincing him to return to international duty with his native county. At that stage, Rankin remained hopeful of being named in one of England's winter squads but that did not come to pass. Rankin will be eligible to return to Ireland duty on 17 January, which will mark two years since his final one-day appearance for England. The seamer also played seven one-day internationals and two Twenty20 internationals for England. If Rankin does return to the Ireland fold, he will available for the World Twenty20 in India in March. A lack of bowling strength has been Ireland's main weakness in recent years and Rankin's return would be a major boost for coach John Bracewell.